The campground at Hunting Island State Park was mostly destroyed by Hurricane Irma in September, 2017. We are planning to take new photos and will post when available. Sorry for the inconvenience. 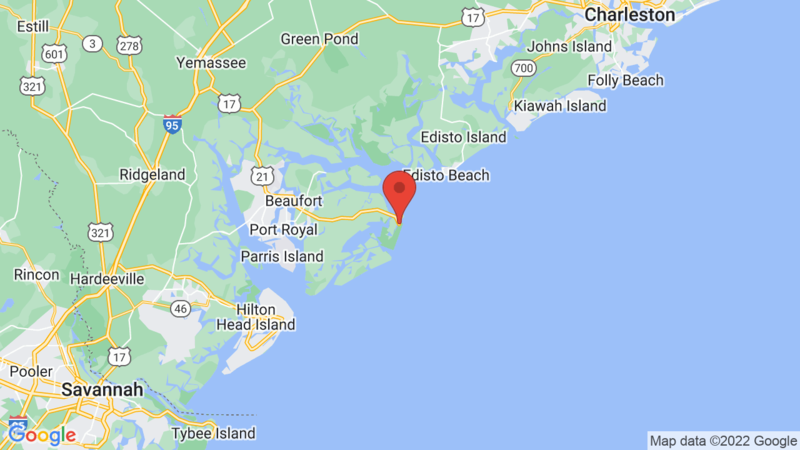 Hunting Island State Park Campground is located in a beautiful semi-tropical barrier island and has a total of 101 campsites with water & electric hookups (50 amp). The campsites can accommodate tents, trailers, and RV’s (40 feet maximum). There are also several tent-only campsites, cabins and one primitive group campsite. Each campsite has a table, fire ring, and grill. The campground has flush toilets, showers, water, a dump station and camp store. 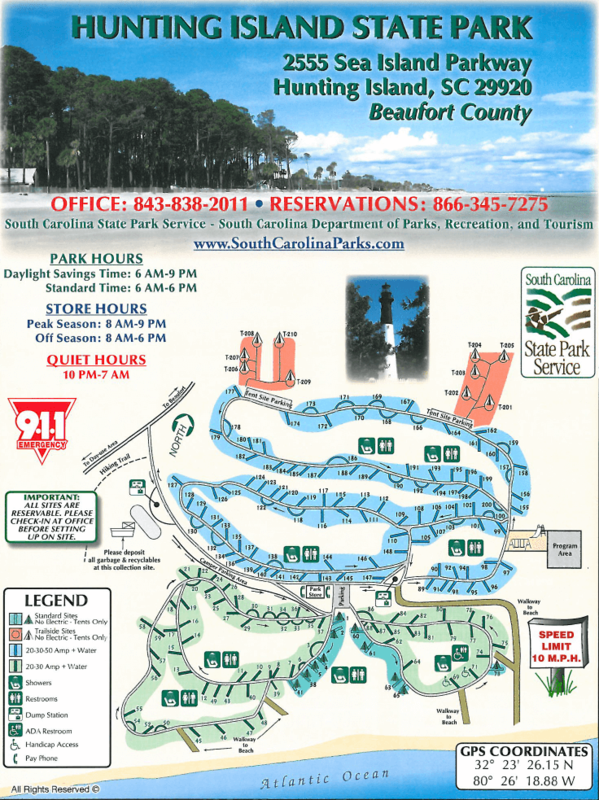 The Park also has a visitor center, gift shot, grocery store, nature center, fishing pier, a boat ramp, picnic area, playground and 10 hiking trails. Free WiFi is also available. Hunting Island State Park features a variety of land and marine wildlife. There are five miles of beautiful beaches, a lagoon, and thousands of acres of marsh and maritime forest to explore. You can even access the 130 foot tall Hunting Island Lighthouse and take in panoramic views of the coastline and forest. You can also ride horses on the beach from December through February. Edisto Beach State Park is another option. It’s about 83 miles away (on the coast) and has 228 campsites. 8, 18, 39, 75, 89, 109, 125, 156. Visted Hunting Island State Park Campground lately? We'd love to hear about your adventure. Did you find us useful? Did we forget something? Anything our community should know before heading out to Hunting Island State Park? Visited Hunting Island for Labor Day weekend 2013. Price is great, location is great but mosquitoes will eat you alive. Will never visit again during summer. If I ever go back it will probably be in late fall- winter season. We camped here last year in our 24 Coachmen travel trailer. The sites and roads seemed tight at first, but once we set up in site 145, we had lots of room, super convenient access to the well stocked camp store and beach. We absolutely loved the park and had a fantastic time. We are booked again for this summer and can’t wait! I was fortunate to have stayed there in March of 2016. Sadly many of the sites featured in the photos that are close to the beach were wiped out by hurricane Matthew in the fall of 2016. That area is now being converted to a day use area. The sites away from the beach are very nice but the sand gnats can be torture! You need to update your information. Campsites 1-88 no longer exist. Pictures of some of the campsites are outdated….they no longer look like the ones you have featured. The hurricane was devastating to the park but the rangers and local volunteers have come through the event, making repairs as necessary. They are to be commended. The park is still an absolute jewel. We have not yet been able to schedule a photographer to reshoot Hunting Island State Park, but will later this year. In the meantime, we will take down the photos.